You might have noticed a few new additions at some of the BCG Chicago courses. 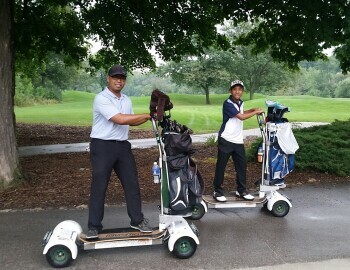 We have started to add GolfBoards rentals to some of our cart fleets! The GolfBoard is specifically designed with a long lasting lithium ion battery and thumb throttle, requiring users to grip handle for extra stability that won Best New Product at the PGA Showin 2014. We are very excited to have offer these at participating courses and look forward to having our guests enjoy the ride! Eliminates the sedentary activity of sitting in a golf cart. Reduces turf wear thanks to a lightweight frame and smaller wheel footprint. Where you rent a GolfBoard? *Each golfer is required to sign a waiver agreement and additional training prior to renting a GolfBoard at any participating facility.